Figure 1: the ideal head and skull. Eyes should be dark (except in chocolates) and oval. Round eyes are a fault. 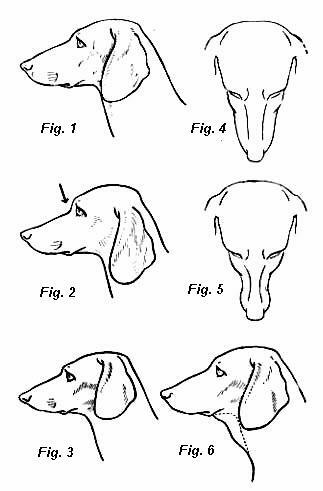 Figure 2: excessively pronounced stop, low set and folded ears. Figure 3: short, snipy jaw, with high-set ears. Figure 4: ideal head, seen from above, with the jaw tapering uniformly to the nose. Figure 5: faulty jaw, pinched in between the eyes and nose. Figure 6: shows dewlap (baggy skin under the neck). The skin should fit closely all over the body.